Hang Dai Editions is releasing three graphic novels this September in conjunction with Alternative Comics. 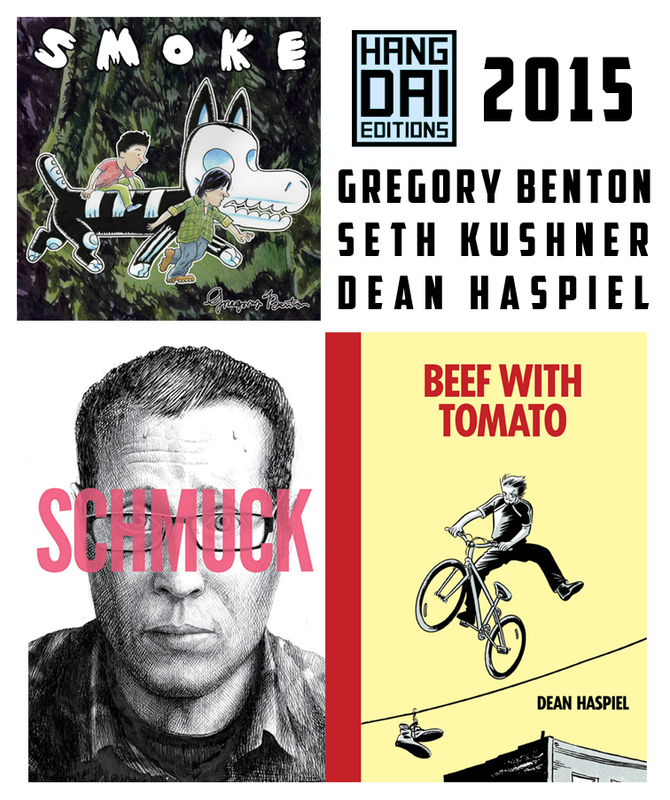 Showcasing Gregory Benton’s SMOKE, Dean Haspiel’s BEEF WITH TOMATO, and the late Seth Kushner’s SCHMUCK. After an accident on an industrial farm unhinges two young brothers from reality, they are guided through a weird and wonderful journey by Xolo, the Aztec’s mythological protector of souls. Gregory Benton’s book B+F was awarded the Museum of Comic and Cartoon Art’s inaugural Award of Excellence at MoCCAFest 2013. An expanded version of B+F was published in the autumn of 2013 through Adhouse Books (USA) and Editions çà et là (France). The long form edition of B+F was selected for the Society of Illustrators first Comics and Cartoon Art Annual in 2014. Gregory has written and drawn stories for Nickelodoeon, Vertigo, DC Comics, Disney Adventures, Watson-Guptil, Entertainment Weekly. Gregory has also produced numerous limited-edition mini-comix, some of which reside in The Library of Congress’ rare books collection. Dean Haspiel is an Emmy award winner and Eisner and Harvey Award nominee. Haspiel created BILLY DOGMA, illustrated for HBO’s “Bored To Death,” was a Master Artist at the Atlantic Center for the Arts, is a Yaddo fellow, a playwright, and is the co-founder of HANG DAI Editions. Dean’s comics include The Fox with Mark Waid, The Alcoholic with Jonathan Ames, and The Quitter with Harvey Pekar. One man’s awkward coming-of-age-quest to find love in New York City, illustrated by 22 artists, whose individual short stories together tell a complete narrative. Artists include Josh Neufeld, Nick Bertozzi, Dean Haspiel, Gregory Benton, Noah Van Sciver, Stephan DeStefano, and Christa Cassano. Cover Art By Joseph Remnant. Book Design By Eisner Award Winner Eric Skillman. Seth Kushner was an environmental portrait photographer whose work has appeared in The New York Times Magazine, Time, L’Uomo Vogue, Sports Illustrated, The New Yorker and others. He was a founding partner in Hang Dai Editions with Dean Haspiel, Josh Neufeld, and Gregory Benton. This entry was posted in Uncategorized and tagged Alternative Comics, comix, Dean Haspiel, graphic novel, Gregory Benton, Hang Dai Editions, Jonathan Ames, Memoir, Seth Kushner. Bookmark the permalink.